Dashi Namdakov is a brilliant sculptor, graphic artist, and jeweler from Buryatia, Russia. His work continues the area’s rich Central Asian traditions, with a sleek, modern twist. 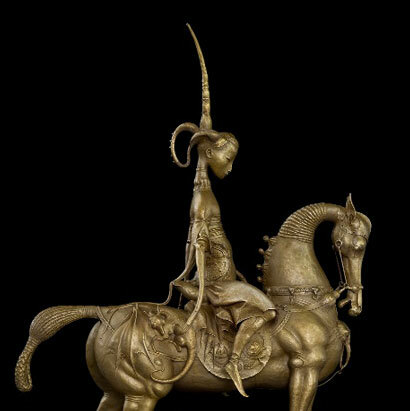 Each sculpture exudes a unique combination of strength, grace, and mystery, encapsulating the period of Genghis Khan’s rule. Dashi is one of the only living artists to have exhibited at the world class State Hermitage Museum in St. Petersburg, Russia. In his jewelry, Dashi seeks to draw attention to the connection between Man and Nature. Motifs of both wild animals and mythological creatures prevail, featuring the untamed beauty of undulating tendrils and feral eyes offset by elegant diamonds and jewels. All this rugged majesty is contained within a delicate pendant or a graceful ring, directly connecting its wearer to the spirit within. In addition to his exhibition at the Hermitage, his work has also been on display at the State Tretyakov Gallery in Moscow and in prominent museums throughout Siberia. Additionally, Dashi’s sixteen-foot-tall sculpture of Genghis Kahn stood for six months at the Cumberland Gate in Marble Arch in central London. During his second trip to the United States, his sculptures and jewelry works will be prominently displayed at The National Arts Club. By Kalmyk Brotherhood Society in News on June 7, 2013 .